It was a Saturday morning in late April, and I was headed home for the weekend to see my family. I pulled out my phone and called an Uber to the airport. Raymond, rated 4.6 stars, was four minutes away. Minutes later, a man in a silver Toyota Corolla pulled up to the side of my dorm. He noticed I was carrying a few bags and got out of the car to help me. I thanked him for his help and sat in the back of the car. The car smelled of thick cigarette smoke and french fries. I opened my window slightly to let in some air, and when Raymond took the driver’s side we exchanged the normal small talk before I looked down at my phone, aimlessly scrolling through social media and responding to texts. Suddenly, the car shook as he drove over a pothole on Freret. The streets are still a mess after the damage that Hurricane Katrina left in 2005. After the storm, nearly 80% of New Orleans was underwater.6 Many people lost their homes and their lives. It is estimated that the total cost to repair the damage was over $100 billion. 7 Even 12 years after the storm, the streets and infrastructure are damaged and many people were never able to come back to their homes. Raymond played rap music at a loud volume and drove above the speed limit. Despite wanting to tell him to drive slower and turn down the music, I sat quietly in my seat. “So you’re a Tulane student,” he said. I looked up and confirmed. “Must be nice being able to go there,” he mumbled. I explained how I enjoyed going to school there and knew I was getting a great education. He laughed under his breath. I wondered what his laugh was linked to. Was is the fact that Tulane’s student body is broken down by 70.9% of the students being white, while only 8.6% of students are black or African American? 3 Maybe his laugh was because “The median family income of a Tulane student is $180,700, and 69% come from the top 20 percent.” 2 While located in a diverse city, Tulane lacks diversity on campus and appeals to mostly upper class white people. Tulane student, Zharia Jeffries, wrote about her experiences of being a black student on a predominantly white campus. She states, “Being black at a mostly white university is like being an invisible target. Invisible because I am normally seen as everything but a student.” 4 Jeffries also acknowledged that, “being black on a college campus is the same as being black anywhere else in America: “You are not exempt from the racial violence and harassment generated by the current political and social climate” 4 It is ironic that marginalization exists on a campus that is located in a city that is heavily populated by black people. “That’s where all you rich white people live,” he shot back at me. Uncomfortable, I did not know how to respond. It was true, I grew up in an affluent community, surrounded by wealthy people. It was what I was born into. No one had ever explicitly made an assumption about me based on where I was from. “You must be living off of your rich daddy’s money,” he said. I felt a tightness in my chest as I explained that my parents are extremely hard workers and have been incredibly generous with me. I wished I didn’t respond and wondered why I felt the need to justify my class and status based on assumptions he was making. There was a moment of silence. I looked out at the window and saw a homeless black man on the streets, shaking a jar filled with a few dollars and some coins. He was approaching windows asking for money. My guilt grew as the evident economic divide between black and white people in New Orleans was literally inside and outside the car that was driving me to the airport on my way home. I knew the facts of black and African American people being displaced after the hurricane. Today, the median income among African American households is roughly $25,806 while the media income for white households is $64,377.1 This is disproportionate being that are six times as many African American households living in income poverty than white households.1 This reality inevitably creates feelings of unease for African Americans who are nonetheless working just as hard if not harder than white people. I grew even more uneasy. I felt ashamed, embarrassed, and uncomfortable. I had never felt so judged. He knew nothing about me or my family besides where I was from and went to school. However, often times just the way people act or speak can signal something about their class or status. In a study on economic inequality, Michael W. Kraus, Jun Won Park, and Jacinth J. X. Tan theorize that, “social class signals activate social comparison processes that strengthen group boundaries between the haves and have nots in society.” 5 In other words, perhaps the way I was speaking or responding to his questions validated his initial assumption of my socioeconomic status. I felt my face get red. My entire life I have been surrounded by people of all races and have never treated anyone differently. When I was younger, I was taken care of by an African American woman, while my parents were at work. She was a huge part of my life and essentially helped to raise me into the woman I am today. I care so much for her and continue to help her send home clothing and food to those she left behind when she moved to America. Her race and socioeconomic status never impacted my opinion of her. However, even though she felt like family to me, the reality was that she was an immigrant with limited opportunities and therefore had to work in the service industry. I wanted so badly for us to be equal and to help in whatever way I could. He, however, assumed something about me, and all people of my race and socioeconomic status, that was both generalized and stereotyped. While many black people are still enduring the damaging effects from Hurricane Katrina, a large group of white people brought gentrification and believe that the the city has improved. many white people believe that the city has been prospering even after the storm. Lakeview, a wealthy white neighborhood suffered extreme damage from the storm. However, Today it is more advanced than and modern than it was before the storm.6 In the ninth ward, however, a predominantly black neighborhood, you can go miles without seeing a single home. Many of the homes were never recovered, and therefore many black people were never able to return to New Orleans.6 While white people now have access to an improved education system and were able to move back in to their homes, many black people were not given the same opportunities. It is possible that Raymond lived what I was only just realizing. I suddenly felt even more guilty and bad for Raymond. I wished there was more I could do. I wished so badly he didn’t think of me this way. I checked my maps on my phone and there was five minutes left in the ride. I let out a sigh of relief. “Are you flying private?” he asked. We pulled up to the terminal and I was so eager to get out. “When you leave, princess, I’m gonna tell all my uber friends about how I drove a rich white girl and she was getting on her daddy’s private jet.” None of that was true. Why was he making all these assumptions about me? Too uncomfortable to answer, I got right of the car. This experience, opened my eyes that there really is a racial divide in New Orleans. I were in charge of solving the problem of the evident racial divide that exists, I would first ensure that people were aware of this divide and to work toward rebuilding the city not just for the middle class white people, but for everyone in the city. Additionally I would redefine the idea of success. I would create a city where success was not solely measured on how much money you make or what industry you work in, but on hard work and dedication. This mindset would be called, Amnessnes, which translates to a way to measure success based on other factors that don’t concern money or a career path. I would make everyone who moved back to the city post Katrina feel proud to live here and proud to be working hard. Regardless of race or socioeconomic status, I would want everyone to feel as though they are treated fairly and equality and that no one is left behind. I want to get rid of the invisible wall in New Orleans. Dedrick Asante-Muhammad. The Racial Wealth Divide in New Orleans. The Racial Wealth Divide in New Orleans. “Economic Diversity and Student Outcomes at Tulane.” The New York Times, The New York Times, 18 Jan. 2017, www.nytimes.com/interactive/projects/college-mobility/tulane-university. “How Diverse Is Tulane University of Louisiana?” College Factual, 22 Feb. 2019, www.collegefactual.com/colleges/tulane-university-of-louisiana/student-life/diversity/. Jeffries, Zharia. “Black on Campus: Invisible Target.” ViaNolaVie, 2 Mar. 2018, www.vianolavie.org/2018/03/02/black-on-campus-invisible-target/. Kraus, Michael W., et al. “Signs of Social Class: The Experience of Economic Inequality in Everyday Life.” Perspectives on Psychological Science, vol. 12, no. 3, 2017, pp. 422–435., doi:10.1177/1745691616673192. Rivlin, Gary, et al. “White New Orleans Has Recovered from Hurricane Katrina. Black New Orleans Has Not.” Talk Poverty, 5 Mar. 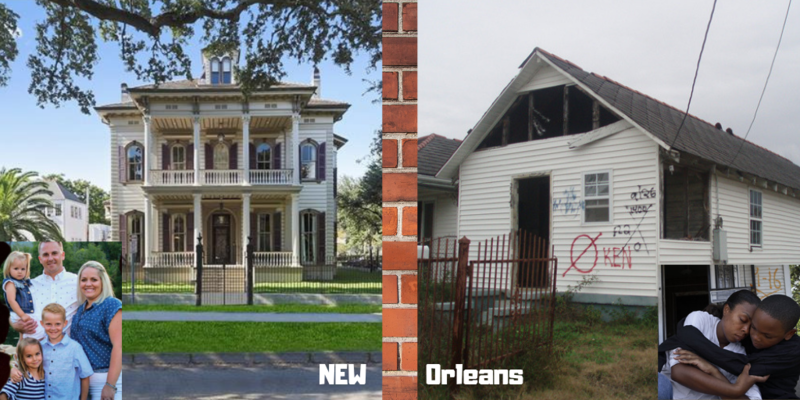 2018, talkpoverty.org/2016/08/29/white-new-orleans-recovered-hurricane-katrina-black-new-orleans-not/. Servick, Kelly. “More than 12 Years after Hurricane Katrina, Scientists Are Learning What Makes Some Survivors More Resilient than Others.” Science | AAAS, American Association for the Advancement of Science, 1 Mar. 2018, www.sciencemag.org/news/2018/02/more-12-years-after-hurricane-katrina-scientists-are-learning-what-makes-some-survivors.